Long before Jack Bauer, there was another action hero who experienced adventure 60 minutes at a time. The original man of the hour was Rex Tyler, an exceedingly punctual chemist who developed a vitamin pill that turned him into a superhero for a short time. 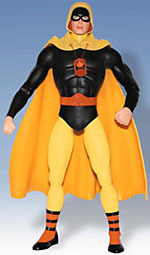 Rick Tyler honors his father's legacy by fighting crime in his guise as the third Hourman. Like the original Hourman, he gains superhuman strength, stamina and speed from the drug Miraclo. A gift from the second Hourman (an android from the future) Rick wears an hourglass which gives him the ability to see one hour into the future. As a child, Rick was often overlooked by his father, who was too busy playing superhero to really care about his family. See, not only was the Miraclo addictive, Rex was addicted to superheroing, as well. He was basically a workaholic in a mask and cape. And like many children of workaholic parents, Rick was desperate for attention. He originally became Hourman during Crisis, then joined with other sons and daughters of JSAers in the team known as Infinity Inc. - a team which, incedentally, also included Huntress and Power Girl. Rick is one of the few from that team to be moved up from the kids' table, so to speak, when he joined the newly re-formed Justice Society. 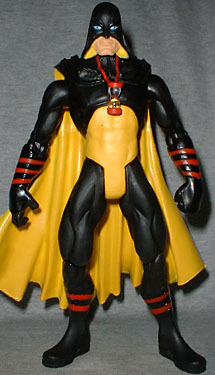 Hourman is 6¾" tall, and moves at the knees, hips, elbows, shoulders and neck. So yeah, not only does he not have a waist, he also doesn't have any kind of wrists. DC Direct really needs to get their act together: this is unacceptable. The sculpt leaves a lot to be desired, as well; Mike Berling has made some really weird choices. To begin with, Hourman's right hand looks like it's clutching something, but it's not like he has any accessories to worry about. Both his hands are held with the palms facing back - a bad posing decision that could have been fixed with wrist joints. His eyes are too big for his head, and his hood/mask is pressed too tightly against his face. His stance has him leaning pretty far forward, and his boots don't look like they could accommodate human feet - they get too flat right behind the toes, so he kinda looks like a duck. On the plus side, the paint is very nice. Hourman's modern costume is pretty cool, because it's almost exactly reversed from the Golden Age look - they're both yellow and black, but the sections have been flipped. His weird yellow trunks have a raised edge, and the detail of the sculpt is softer on them - suggesting that they're a separate layer over the rest of his costume. 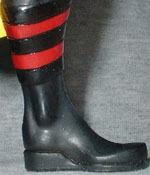 The red stripes on his boots and gloves are sculpted in, and there's a small sculpted hourglass on the inside of each wrist that also gets a red app. Hourman has one accessory, sort of - it's his magical hourglass thing. And while it looks nice enough, with the red ends and the clear "glass," it has at least one big problem. Instead of actually having a loop of cord so it can hang freely, the cord is a straight piece with the ends glued to the back of his neck. It's too stiff to hang properly, and also too thick to let the hourglass move around like it should. It's not terrible, but it's not really good. And really, "not terrible, but not really good" pretty much sums up this Hourman. The articulation is below average, the sculpt needs work and the simple accessory has problems. Really, the biggest thing going for him is the character's design and the fact that he's painted well. "Woo-hoo." Excitement. If you want the modern Hourman, you'd be better off buying the Golden Age Hourman DCD put out in April 2001 and repainting it.